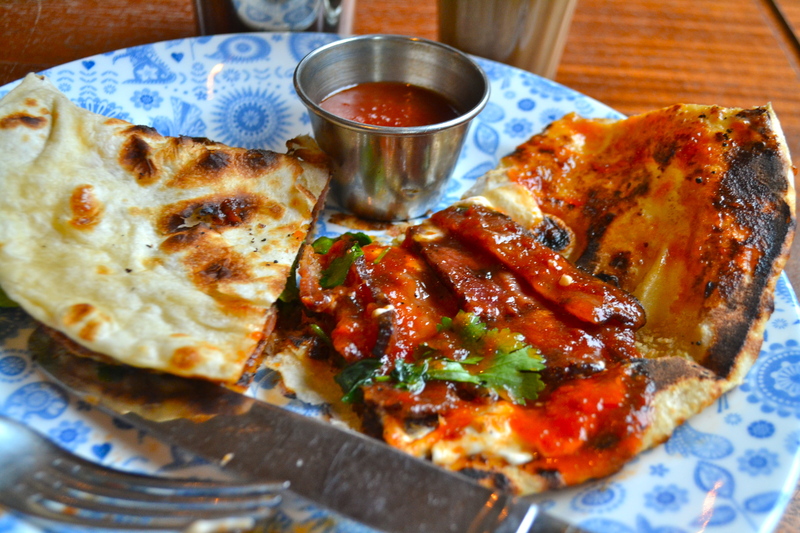 Dishoom’s Ginger Pig Bacon Naan Roll – is this the best bacon roll in London? Get your food bucket lists ready! I may have found the best bacon roll in London. But it’s not the traditional British interpretation of the bacon roll with brown sauce. Get your chops down to Dishoom pronto for their limited edition bacon naan roll, featuring Ginger Pig’s much famed bacon. It’s a big call but this thing of beauty is one of the best things I have eaten for breakfast – ever. 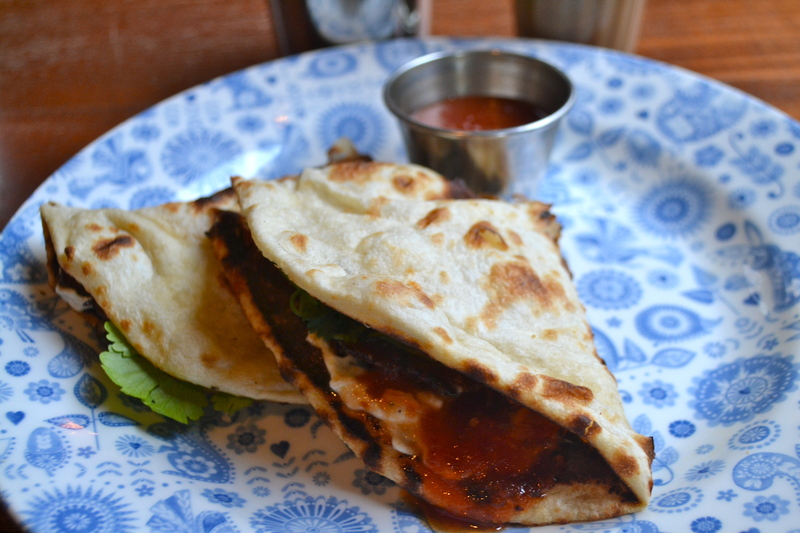 The Ginger Pig bacon naan roll is pure genius. 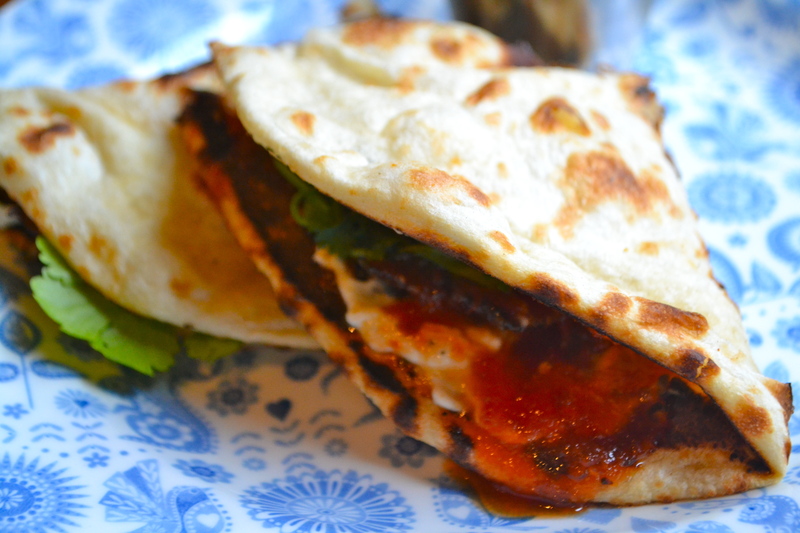 Warm fluffy naan bread wraps delicately over an indulgent filling of bacon, cream cheese, chilli tomato jam and herbs. Salty, sweet and tangy flavours meld together perfectly like one happy family. Even the naan itself is fresh from the tandoor oven and baked to order. But let’s be honest, this roll is all about the bacon. Acclaimed rare breed specialists, The Ginger Pig source the streaky bacon from Tamworth, Berkshire, Old Spot and Plum Pudding pigs. The bacon then goes through a special process of dry-curing with rock salt and demerara sugar, then cold-smoked over oak chips. It’s crispy, salty and very tasty. The new Shoreditch branch of Dishoom has been brilliantly executed, extending the overall Bombay cafe theme of its original Covent Garden store with a more eccentric twist. 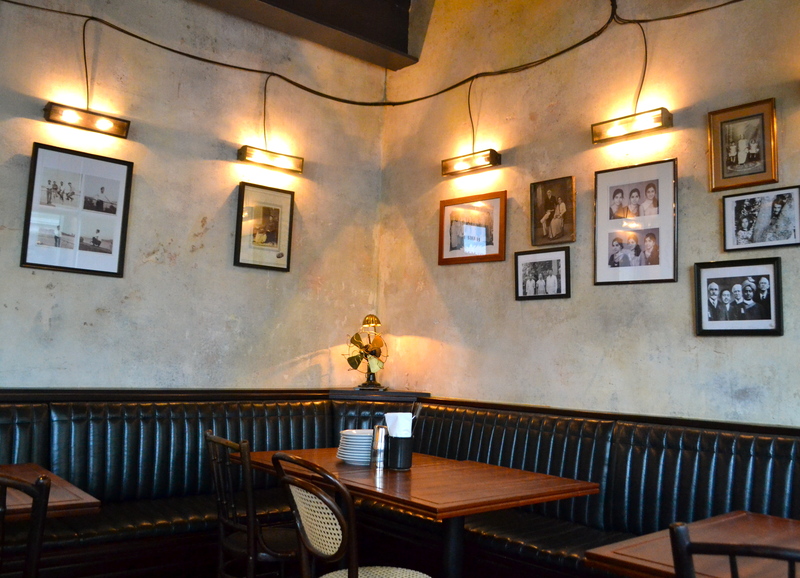 Think wrap around leather banquettes, bentwood chairs and sepia family portraits flanking the walls. It’s got a bit more Shoreditch cool about it, choosing a more industrial chic look with its semi washed walls and exposed piping, but that’s just the way we like it. Dishoom has recently featured in my ‘5 top brunches in London’ list and with breakfast options like this it’s for good reason. My love affair with Dishoom and their brunch keeps getting better and better. Easily the best bacon roll you will find in London. The only problem is trying to stop at one. The Limited Edition Bacon Naan Roll ((£5.90)) is available until the 2nd November 2013 at Covent Garden and Shoreditch branches until Saturday 2nd November. Breakfast is served between 8am and 11.30am Monday-Friday, and between 9am and 12pm Saturday and Sunday. Yum – that looks and sounds sooo good. oh no! i am hoping they extend it. You can still enjoy the original bacon naan roll, it’s still delicious! No worries, let me know if you need any more tips. They do great vegetarian food. Also Gymkhana in London do a great vegetarian tasting menu. Went there last night and the food was something else.